Volume IV of The Arab-Israeli Conflict is a fundamental research tool for students of the Middle East and for those responsible for U.S. policy-making in that area. 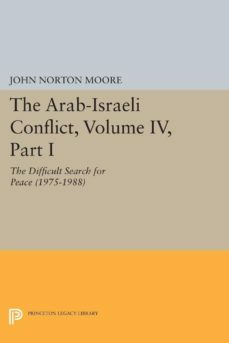 It is a successor to John Norton Moores widely acclaimed three-volume compilation of readings and documents on international law and the Arab-Israeli conflict and to the one-volume abridged edition of that compilation, published by Princeton University Press in 1974 and 1977 respectively. Additionally, Volume IV stands on its own as a documentary history of the period from the September 1975 Sinai accords through the Shultz peace initiative and the Palestinian uprising in December 1988.Originally published in 1991.The Princeton Legacy Library uses the latest print-on-demand technology to again make available previously out-of-print books from the distinguished backlist of Princeton University Press. These paperback editions preserve the original texts of these important books while presenting them in durable paperback editions. The goal of the Princeton Legacy Library is to vastly increase access to the rich scholarly heritage found in the thousands of books published by Princeton University Press since its founding in 1905.